Love this bench on my small porch. The only complaint is we didn't have enough of the hardware to complete the bench, otherwise love the look. For customer service inquiries or to initiate a return, please contact OneBigOutlet at rgereturn@gmail.com or (909) 595-5901. OneBigOutlet is dedicated to our customer's 100% satisfaction. We will issue a refund if you are not satisfied with your purchase and notify us within the 30 days of product receipts. It must be returned in the original packaging and in new condition. Returned product is subject to a 50% restocking fee under the circumstances of being returned in non-resellable conditions. Make your garden or path complete with an antique rose style bench to sit and rest on while enjoying the great outdoors. 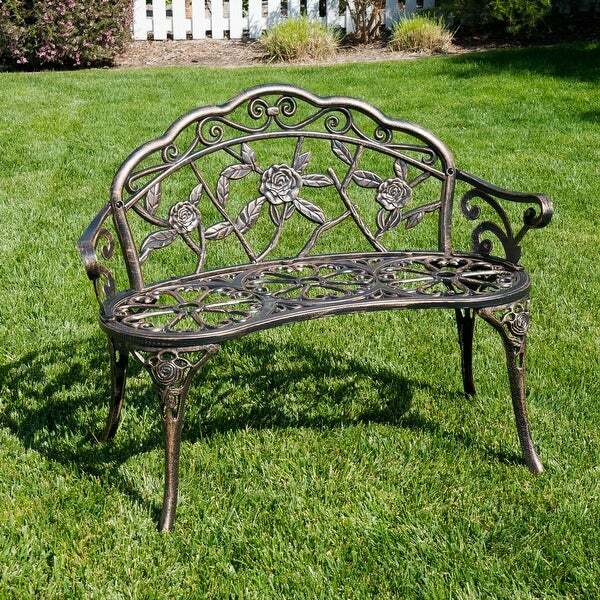 Made of cast iron and lightweight yet durable metal this bench is sturdy yet comfortable enough to relax on in the sun. The seat is composed of metal to provide optimal support. The bench an antique look that will fit perfectly with any outdoor decor and allow it to maintain its stylish look. Add a touch of style to your backyard or garden with this beautiful bench. This bench is super adorable and sturdy. Would recommend getting the bistro set that matches for the perfect comfy patio look. Definitely recommend.